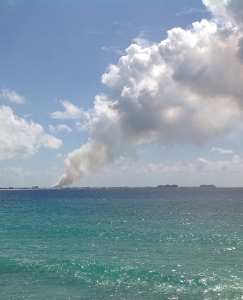 (CNS): Although there were no ships in the George Town port on Friday morning, on Wednesday and Thursday some 26,000 cruise ship visitors and more than 10,000 overnight guests had already been subjected to the smoke and fumes from the George Town landfill, which has been burning since early Wednesday morning. While fire crews and staff from the Department of Environmental Health (DEH) are working round the clock to tackle the blaze, the fire is deep inside the garbage mound, making it very difficult to extinguish. Chronic under-investment at the dump over the years also means there is a shortage of working equipment that could help in the firefight. Already a difficult fire to fight, the shortage of equipment is hampering the situation, though the DEH has hired additional excavators to help turn the garbage over and get at the source of the fire. The hope is that the fire, which is now under control, will be extinguished within a few days. Fire officers have contained the fire and prevented any risk of igniting other parts of the dump. Having drilled wells to keep up the necessary water supply since there are no hydrants at the site, fire crews are now saturating the garbage. Weather conditions have remained in the fire fighters' favour, with the wind driving the smoke to the east, allowing the crews to fight the fire more safely. However, the change in direction gives more residents and visitors a concentrated whiff of the burning rubbish. Thousands more visitors over the coming Valentine’s weekend, one of the busiest for the tourist sector, will be enjoying romantic dinners against the backdrop of burning garbage -a serious blow to the marketing achievements of the Department of Tourism. Budget constraints, a failure to develop a recycling programme, political wrangling and special interest influence are among the issues have plagued the country’s landfill for years. Now, at a time when the situation has reached crisis point, Osbourne Bodden, the minister with responsibility for the landfill, who is taking the flak for years of neglect, has his hands tied by financial constraints forced upon the Cayman Islands by the UK. However, Bodden has committed to spend whatever funds he can scrape together in the coming months to help improve matters at the site and give the DEH the tools they need to properly manage the garbage pile in the short-term. In the long term, he has committed to enter into a public-private partnership for a comprehensive waste-management solution at the site. As a result of the under-funding and budget cuts, equipment needs to be replaced or repaired in the short–term and the managers need to be able to source aggregate to help in the compacting process to reduce the risk of future deep-set blazes. While all open face landfills are at risk of such problems, the counter measures that help reduce them have recently fallen by the wayside, adding to what the wider public sees as another major critical issue for government’s growing list. Asthe dump continued to burn, the Cayman International School, located close to the landfill, remained closed Friday. Here’s some information about Bell Mills Park in Virginia which was built over a former Landfill. And also The Thurrock Thameside Nature Park at Mucking, which lies on top of 50 years of waste from six London boroughs, has been restored to grasslands, woodland, ponds and reedbeds. These are realistic options for the GT dump which can be started right away and end up being something that will actually enhance the GT Area. Mining the GT dump and removing everything there would be the best option but it would cost 10’s of Millions of dollars to do and take decades to complete, and don’t think for a second that someone is going to come here and do it for free because the trash can be converted to gold. Capping the dump would be a lot better than doing nothing and letting it sit there for another 2 or 10 Years..
DART has been the only solution that should have had been sorted 20yrs ago. Ozzie has no solution other than to stall and waste more money, and BT doesn't want a new facility in their back yard but are quite content to contiue adding to the problem in GT. That's the situation in a nutshell. Maybe the site of the private school and Camana Bay could be utilized for the new dump? They are both next door so what could be easier? Mr.Dart could try and sell off the land he bought in Bodden Town and build a new Camana Bay and school somewhere else. Problem solved. Isn't Camana Bay little more than a White Elephant/Folly anyway? No one goes there, so best to "dump" it and move on and learn from past mistakes. What about those of us who have a longer-term exposure to this horible health risk? Inhaling toxic fumes is unpleasant and potentially physically and economically damning if in the lungs of a guest, but what about those of us who absorb this toxic brew into our lungs for days? What about our children, the aged, the cronically ill? This isn't about politics or tourism, it is about the health of this blessed nation. Yes, tourism will suffer, but people, is that the priority? Those who voted the current leadership into power must rise up and voice their concern. Don't blame, demand responsible representation. I have read the proposals offered for resolution and there is an immediate remmedy. I have absolutely no polictical or economic interest or bias, my concern is for the people of this island. Demand the Dart Solution Now! Just exactly what is the Dart Solution. We are told that the present site will be remediated by Dart;which I believe will only mean that some sort of cap will be put on top and maybe some grass planted.However since the landfill is not lined ,toxins will continue to leak from that site.All the toxins that exist at present ,will still exist in the future.So tell me is this a real solution ,or a "pretend" solution that allows Dart to expand Camana Bay and make multi millions.Or will the solution involve hauling away all the garbage at Mount Trashmore to a new Waste Management Facility/Dump..
None of the solutions offer include hualing the garbage away, a few of them included mining the pile of trash but Cayman cannot afford it. There is also the risk of releasing more toxins into the air if this is done. Capping the dump would stop the fumes as well and the leaching this is done all over the world.. Certainly you do not believe that putting a cap on top of the dump will stop it from leaking chemicals underneath;that is similar to saying that if I put a cover on my leaking swimming pool will stop it from leaking water out the bottom.The present landfill is unlined (no protective sheeting etc underneath) so there will continue to be leaching out of the bottom of the landfill. You should try reading the letter to the Compass last week by the Caymanian enviromental science specialist. That pointed out that putting a liner over the top would stop the rainwater draining through the dump and washing out the toxins, and putting a lined trench between the dump and the Sound would stop the ligration of leachate. Both of which are part of Dart's proposed (free) solution. Putting a liner underneath is not possible, but this sounds like the best option available (and the new dump would be lined). As the person is an expert and, a Caymanian with our country's interests at heart, and completely independent of Dart, you may want to listen to them. Unfortunately a lot of people let their hatred of Dart or desire to keep any form of facility away from Bodden Town blind them to the fact that we have no other workable and affordable solution. Yes it does, just google it..
Here’s a few Articles than explain it, this is common practice done all over the world with great success rates. Done believe the hype about mining a dump and creating free electricity. No one really expects they will actually make some kind of decision that they will stand behind and get it done do you? Really? Same guys doing the same thing and ending with the same failure to even work on a problem much less solve it. If anything is going to get done it will not be done by any Government entity. Time to call in someone with experiance in running and fixing big dumps. Or just get used to the same lame blame game. Good thing we spend $10M a year on the Turtle Farm but let this disaster continue. My kids go to CIS and I have to seriously think about sending them back. What is the long term damage if they spend 10-15 years in that school. Also vry scary that they doue the blaze with water, then where does this water go that is full of toxins? You ask some very pertinent questios.Just hope you are asking them of the Dart Group,afterall they built the school next to the dump.Perhaps they were too certain that they could get the dump site moved. Government promised the Dart folks that the dump would be remediated in order to get them to spend a half billion dollars investing into Cayman. I sure thast by now Dart realizes that he should have done it elsewhere other than Cayman, but he was fooled into thinking this was a good place to invest or that he would be welcomed. Lucky for me I started reading CNS before spending my retirement money on a place in Cayman.. I'm really concerned about the level of toxins we are breathing in the air as a result of this fire, and if they are going into the ground with the falling rain. How can we find out how bad these toxins really are and what health related problems they could cause? What bad timing by this fire .Surely it could have waited for the slow season before erupting. Mean old fire. The concern over the toxins is a good observation. Can you imagine the risk it posses to firefighters and DEH crews who have to stay there and deal with it. What is so disgraceful is that the government donot recognise the work of those officers who have to work in such hazardous environment by paying them a decent salary. This is a matter thst has to be address as well. Mr. Eric Bush and Ms. Jennifer should work together and try to address the matter. You have a right to worry…Most Caymanians do not comprehend the seriousness of the toxin, that we burried in the dump since the1970s. Thats why some want it to remain where it is.Mostly just to spit Dart and at the same time putting all at risk of serious diceases. It's no wonder our cancer rate is so high in this Island. With the cruiseships piers being implemented asap, SMB will disappear, and Mt. Trashmore is killing everything in the North Sound due to leakage so Stingray City is not far off from death, it will soon be time to resort to thatch rope and wompa making, and we will revert to the "island that time forgot". Tourists can always go to the ever-lovely Bodden Town, which is so special it will never have a landfill. Maybe Bodden Town should even be made the capital of the Cayman Islands again. Bodden Town ??? have you seen the delapidated buildings and the state of border fences??? give me a break!! lol – I wasn't being serious. I know too well the conditions in BoddenTown! Bodden Town is the most picturesque place on th Caymanian Landscape and Bodden Townians are the friendliest most welcoming people you will ever meet. Great then is will be Cayman for Caymanians again, isn't that what everyone wants..
No, they want Cayman to be for Caymanians again and to keep all the toys that progress has brought. Firstly, that the discussion has been primarily centered on the tourist/business perspective is important. However, why is there no discussion about the health effects on locals and residents. Surely, the latter is more important that the former!! We're here too! Isn't it obviousthat what's most important is that Bodden Town stay dump free. Because the Health Minister is elected by the people of Bodden Town, and also in charge of the dump. Seems more of an editorial comment than news story, tourists will continue to come to the CI. To resolve the landfill issue it only seems logical to enter into a public-private relationship,this would give the politicians,media and public a target for future frustrations. In reality,the private contractor would have the financial resources and the ability to react and invest with needed equipment to resolve problems as they arise. Since the landfill would be operated for profit, the contractor will develope any and all recycling options to maximize profits. Governments, no matter where, are incapable to operate at break even or profits, they specialize in consultant studies and appointing groups to study. So true…..consultants studies and reviews are the order of theday for incompetence and excuse to import more and more expats to deny caymanians of jobs. If I had the authority I would dismiss every chief officer and head of department who is directly responsible or play any part in such recruitment practice. Same clowns, Different Circus. Same results. If I have to tell you the difference,then you are not who you say you are. At TI Resort you can get a great view of this from the walkway leading to the upper rooms overlooking West Bay Road. His comments are just another addition to the CIG style of always blaming the last administration for the problems they are facing. they do this all the time say it their fault that we don't have money it's their fault the we can't borrow, it this fault it's their fault it's their fault. Bottom line these issues have been going on for way more than the last four years so you all are at fault..
Had the last administration used the money they wasted on the Port fiasco, the Cohen loan fiasco, the Turtle Farm loan fiasco, the Ritz debt that was never paid, and the un-recovered Gasboy thefts, they would now be sitting on five times the two million dollars Minister Osbourne claims he bneeds to sort things out at the dump. So do I blame the last administration? Yes, I do, 100% This govermnent has a monumantal task of clearing up the complete shambles the last administration left them. It will take half a generation to undo the damage. Yep Cayman was just perfect before the UDP, there were no issues when the PPM was in power before, they did everything right. Oh and the the Dump only became and issue during the last administration when the dumping started. Enough is Enough. Dart offers a solution that does not affect the public purse. Enough political bullsh!t. Fire Minister Bodden, apologise to Dart with cap in hand and start the process right NOW! Invest for the future and retain our standing as one of the top places to go in the world. My goodness, I've joined in the spirit of things and rather than vote no or the joke thing have added a thumbs up alongside the army of persons employed to approve such twaddle.Kind of amusing all this huffing and puffing 'cause it ain't getting the Dart crew anywhere. Caymanian Compass editorials getting more desperate by the day. Talk about painting yourself into a corner. NEWS FLASH : The Caymanian public aren't going to be influenced the same as they might be in the good old USA. Typical American naivety to imagine they would be. But highly amusing, so to keep us all laughing a bit longer and don't give up just yet, you poor dillusioned chumps. PS Watch you language here in Cayman with your "political xxxxxxxx" . So low class. Destruction of mangroves. Nice plates and cups circulated! We Caymanians would rather die than to except this deal..Ozzie will find a solution and you will eat your words.. This kind of chemical fire needs to be dealt with either by using carbon dioxide injection or digging to expose the fire source, which is very dangerous and could be quite deep. The RCIPS helicopter thermal equipment should show landfill and fire team staff the source. Anyone running a landfill should expect fires and have the tools and training on hand to deal with it. Google it if you have to, ask our partner nations for help, but don't tell us water is a solution. Water is the worst medium to put onto an unlined landfill and it doesn't extinguish this type of fire! They are literally contributing to the poisonous leachate that runs freely into north sound. Residents should also be aware that the airborne toxic hazard is very real, that the wind currents are inland rather than offshore, and that conditions will persist until they get it right. You need to decide whether to let the dump burn or try to extinguish it with what is available to those combating the blaze. Water was the only option and that was because it was free. Government has no money for anything these days other than consultants, advisors etc, as was pointed out by someone else earlier. This along with expensive trips and press conferences are the order of the day. I can't understand why our politicians would vote finds for some of these crazy things when there are so many pressing issues to address in this country. Don't depend on the ministries to assist in any of this because they are clueless. That is from top to bottom in most of the ministries. Lack of experience and knowledge of those in senior positions in the ministries are killing this country. Bad selection of individuals just because they are part of the good old boys club. This is the worse condition the civil service has ever been in in its entore history. It shall come to pass that many appointments should not have been made. It shall come to pass that government will have to pay huge sums of monies in the future for bad decisions. We need to keep mounting the pressure on Ozzie. It's not his fault for the initial dump situation, but Caymanian politicians for too long have turned a blind eye to this. Reprioritize your ministries goals! It is his fault for turning down a solution because it would annoy the 1000 people who voted for him and screw the rest of us. Camana Bay and CIS are vip but BT is not………. This isn't only about CIS and Camana Bay, nitwit. It's also about the North Sound, Seven Mile Beach and George Town, the capital of this country. 90% or more of the GDP is generated within 4 miles of the dump. Bodden Town generates virually nothing and in fact is a drain to the public coffers. Many more people live in GT compated to BT. Plus, noone was saying you create a replica of the GT Landfill in BT. But if you can't see the need to do something AND FAST about the GT Landfil, you're blinded by your own self interests. Dioxin emissions: (remember the Bhopal disaster?) The United Nations Environment Programme (UNEP) considers that for the foreseeable future, non-industrial, uncontrolled combustion, mainly comprised of landfill fires and illegal barrel burning, will remain the most significant source of persistant organic pollutants (POPs) in the form of polychlorinated dibenzo-p-dioxins (PCCDs) and polychlorinated dibenzofurans (PCCFs) in Europe (Thornton, 2002). Gases and Vapors: landfill fires emit a toxic cocktail of ‘Most Wanted’ fugitive gases including formaldehyde, hydrogen cyanide, hydrogen sulfide, nitrogen oxides and many others (OEPA, 2006). Visible smoke might not be visible since compacted waste acts as a good particulate filter, but fugitive gases are able to percolate towards the surface. Emitted smoke is a hazard and has resulted in the imposition of Civil Aviation Authority ‘no-fly’ zones. A particular problem with smoke, which is largely unburned carbon, is particles that have become activated, in the form of an adsorbent, with a huge appetite for mopping-up ‘most wanted’ contaminants. Very small particles, known as Sub PM2.5s (smaller than 2.5 millionths of a meter in diameter) are capable of remaining airborne for days, and together with adsorbed contaminants will pass directly into the bloodstream once inhaled. Groundwater emissions: This is an interesting issue. An uncontrolled release of leachate can occur, even to an otherwise dry site, if groundwater is admitted through a perforated basal liner. Manufacturers of HDPE / LLDPE liners recommend an upper temperature limit of between 60°C and 71°C. Exceeding these temperatures, for even a short time, causes a depletion in the membrane antioxidants and a spectacular loss of service life. At 10°C the service life of a liner might be 375 years; at 60°C the service life will have decreased to around 20 years. This whole thing is frigging disgusting and irresponsible. Government needs to prioritize this issue and people need to take responsibility for their own waste management. Everyone expects someone else to fix the problems while turning a blind eye to their own actions. Stop buying so much plastic/styrofoam, purchase items that are compostable and recylcable, stop throwing things into the dump that are toxic!!!! Please remember that the styrofoam is manufactured by the dart company. He has attributed to the vast amount of garbage at the dump as much an any one else. And there you have it. In many developed countries showing up at work with your take-out lunch in a styrofoam container is tanatmount to lighting up a cigarette at your desk. Yep and styrofoam is your only option huh? How many places do you actually see styrofoam now..I guess these cups are what fills the dump..